Hurricane Harvey forces Sarah Zook to return to the home she fled six years ago when she couldn't face her stern parents' reaction to her unplanned pregnancy. Upon her return, Abram King can think of nothing but the pain she caused him-until he meets Sarah's daughter and realizes that he never really stopped loving Sarah. Sarah and Abram must find a way to face the truth of their past so they can rekindle their first love. After the death of her Englisch husband, Irene Keim seeks a fresh start by staying with her new friends Mary Ruth and Henry Wengerd in exchange for helping them around the house. But when Mary Ruth and Henry's son Marcus comes around, he isn't pleased with the woman they've taken in and is determined to push her out. Misunderstandings abound, but both Irene and Marcus learn that people aren't always what they seem. Independent and headstrong, Carolyn is determined to forge ahead with the opening of her bakery, a lifelong dream, in the Birch Creek home she left ten years ago. But she's in over her head and needs help with the cleaning, shopping, and deliveries. Carpenter Atlee Shetler is visiting Birch Creek to escape the memories of his late wife. He takes a job renovating the new bakery and finds the project-and its owner-to be much more than he bargained for. Both Carolyn and Atlee must face pains of the past if they want to have the bright future God has planned for them. 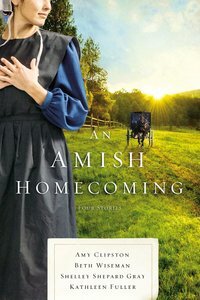 About "An Amish Homecoming: No Place Like Home; When Love Returns; the Courage to Love; What Love Built"
Beth Wiseman is hailed as a top voice in Amish fiction. She is a Carol-award winner and author of numerous bestsellers including the Daughters of the Promise and the Land of Canaan series. She and her family live in Texas.